Decorating in Wizard101 is a fun activity and despite the large amount and variety of items at our disposal, I feel so limited most of the time. And with Housing Tours in the Spiral, it is even more important to have a home that stands out from the lot. If you take a look at the top rated houses in the Castle Tours, they usually are very unique in the way they are decorated and thought out. That can be very frustrating for new Wizards or those who aren't skilled in glitching, when trying to create awesome houses. However, glitching shouldn't be a limiting factor to anyone. That is why I decided to share my tips on how to create new and unique items. 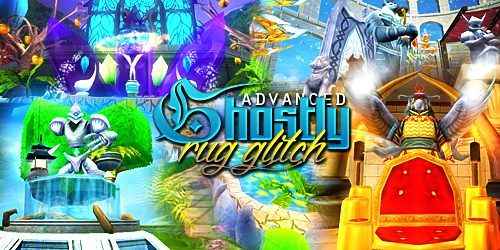 My Basic Ghostly Rug Glitch was featured in Swordroll's Ten Housing Tips From the Pros post and you can also watch my Basic Floating Rug Glitch tutorial, if you aren't familiar with it. I am taking both techniques a step further, with the Advanced Ghostly Rug Glitch. Watch the video below to learn more about it and leave a comment below if you have any question!